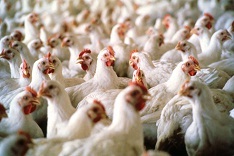 The firm will foray into layer breeding segment by launching "Hy-line" breed chicken in traditional markets of TN and AP. COIMBATORE: Amrit Group, Kolkatta-based vertically integrated poultry firm and one of the major broiler chicken producers in the country, will foray into layer breeding segment by launching "Hy-line" breed chicken in traditional markets of Tamil Nadu and Andhra Pradesh. K Ravindran, Chief Operating Officer of Amrit Group, today said that the Rs 3,000 crore group, partnering with Hy-Line International USA, will introduce the Hy-line breed that were designed to have excellent livability, superior feed efficiency and the highest egg quality, increasing the potential profit of the growers. India is the third largest producer of table eggs, after China and the US. Layer birds are bred and adapted to Indian climate, and International brands like Bovans, Lohmann and Hyline are present in the market. Around 70 per cent of the layer farming is in southern states, Ravindran said in a release here. The group would focus on three southern states of Andhra Pradesh, Karnataka and Tamil Nadu during this financial year and gradually expand to North and Eastern parts of the country in the coming years. India currently has a layer population of 220 million, with layer chick placement of 12.8 million per month, he said, adding the company aimed to capture 30 per cent market share by 2017-18. The breed is best known for its strong-shelled eggs, the best interior egg quality with minimum feed consumption, making Hy-line the industry's lowest cost producer of eggs.